vignette design: Timeless Tole Trays? I used to have a large collection of tole trays. Over the years though, I've narrowed the collection down to just a few that I can't part with. Most of them are in the laundry room because I'm ambivalent about them these days. Although I can't part with them, I'm still not willing to display them everywhere like I did years ago. The laundry room seems like a logical place for them. It still has that French Country/Shabby Chic vibe that I was all about when we first bought the house. So when I saw this beauty at the flea market recently, I was tempted. But passed it up. Ten years ago, I would have bought it! There is a dealer at the Hillsborough Antique Show who specializes in tole trays. It used to be one of my favorite booths, but these days, I walk on by. Still, they take my breath away. Especially the black trays. I love red tole trays too. But they were always a little harder to find. A wall of random colored trays is an example of how tole trays can be really good, or really bad. The soft green trays are gorgeous. 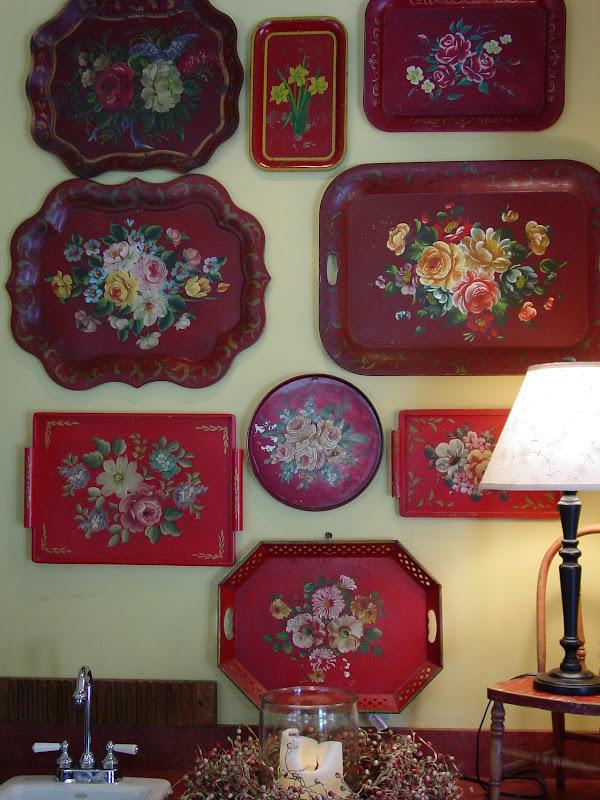 I still like a grouping of tole trays on a wall, or just one standing alone as an accent. So my question is, are tole trays too grandma? I am a tole painter so I love these and recognize several of the patterns used. The ones with the black backgrounds always look the best to me too. Too Grandma? Nah. Just set one near your crocheted doily, your travel spoon collection and your kitty cat ornaments...not that there is anything wrong with any of those things. I just recently became interested in them, and ironically, the two I have came from my grandmother. I don't really think they are "grandmotherly" though. Depending on how they are displayed, I'm sure they can go either way, lol! I definitely share your passion for them! I don't have as many as you do though, BUT I have an antique tea cart with it's original tray AND it's painted in this design. Very ornate. I have seen people get tea carts and remove the original paintings on them AND PAINT THEM "WHITE"! UGH!!! NO,NO,NO it's NEVER out of style, and I think that's what I LOVE most about them! My heart skips a beat every time I see one, but I agree, they can be dating. I'm not willing to part with the ones that I truly love, so I keep them in a safe place on the Island of Misfit Decor. LOL! I've seen them in homes that I adore, scattered in with some more contemporary decor and it works! So I say they are timeless! Thanks for a great post Delores! Hi sweets...love your post and I think I could find some of those trays at Tex Kopke's flea market this very weekend! Just wanted to let you know I wrote about you in my post today and put in a link. You inspire me and I am a dreadful copier of your work...I had to laugh at my table(s)I need much practice! I'd have to agree with the lady who commented that if you paired it up with a doiley and a kitty kat...then it reminds me of grandma. But otherwise, I absolutely love large cabbage roses. I'd like to have one of these in red or black...very pretty! I love them, and I think like all things of beauty, they are timeless. It all depends on what the rest of your house looks like. If you manage to spruce things up with some current looks as well, then I don't believe these would ever be 'dated'. We should always be surrounded with the things we love, that make us happy. I don't think I would want a whole wall of them but they are beautiful accents. My favorite are the black ones. My vote goes for timeless. I use to have several displayed in my home too. Today, I am taking my last three red ones to my booth to sell. It is hard to part with them, but I had to be honest with myself and knew I would not display them anymore. I do think they are timeless, but my style has changed. I love your tole trays and I too think they are timeless when displayed accordingly. I had a tole tray which belonged to my mother and chose to line it with aluminum foil and use it because it was just the right size. I sent it loaded with chicken nuggets to a party with one of my kids. Unfortunately, the mom placed it in a warm oven and it ruined it! I had no idea that the design was so sensitive to heat or I would not have used it! WOW. My Mom had one tray when I was growing up. They are all so beautiful. I think I may look for one for myself. Love the first one you posted. A few years ago I gave them to a young friend who wanted to start a collection for her wall. Made me happy that a young girl was interested in this beautiful art form, so I was thrilled to help her get started with a group of her own. I think that they look beautiful in your laundry room against that gorgeous Pierre Deux-inspired wallpaper. My vote is to keep them and enjoy them. A good friend gave me a large red one when she was cleaning out her home and I treasure it. I have a few more black ones that I have picked up here and there and a huge blue one that I found at a junk sale. I keep them because they are useful and I love them. Whether they are in fashion doesn't influence what I have in my home. Fashions do come and go and I can remember that I would have hated them when I first set up housekeeping the in mid 1970's. Oh now you are starting to hurt my feelings! I never think of my beautiful collection of tole trays as grandmaish.... I love them! I have my black ones as a large display on my dining room wall. My red and green ones are displayed on a bakers rack. I will never part with them and still get excited when I find a design or style I don't already have. How can anything so beautiful be "Grandmaish"? :o If old, with detail, beauty and character PLUS function is "grandmaish" than my whole house is in trouble. If you love it....who cares!! They are beautiful and so are a couple of mine! Grandma's rule! I feel like gme.... wow, never thought of my trays (of which I have 4 on my family room wall amidst french country style oil paintings of sheep and cows) as "grandma-ish"! I think they are beautiful, but for me, the pastel ones are the ones that can go a little "grandma". The red, and especially the black, are beautiful. There is an absolutely stunning French Country store near where I live, she has amazing taste and gets beautiful items from France all the time. She has a few scattered in the store, in fact, she only recently added them so I was almost feeling like they might be "coming back." True, they are not as hot as they were about 10 years ago, but I think having a few around is indeed, timeless (remember your Sister Parish quote~!). Though now I may have to split up my wall and scatter them more..... food for thought! Am I a tole snob?? Ha...I stand corrected, I just walked downstairs and saw the huge tole tray on my coffee table in my front room!! I definitely could never give that one up!! I would not think of tole trays as 'grandm-ish'. I think you need to be a certain collector to have more than one! I have one (black) on my rather large kitchen wall near the closet and whenever I see it, I smile. One is enough for me, two would be too many! I have other collections that maybe some would say is too much! I think that they are timeless. Especially in black. I can understand wanting to use them more sparingly these days in your decor though. I think we have gotten away from the overabundance of florals in our design, but I do think that they can look very beautiful when thoughtfully placed. Not too grandma, I say! Tole trays are timeless and beautiful even if they date you. Thanks for sharing. I have several, but only old ones. The new ones seem grandma--ish. But then I rarely like anything that's brand new.. I agree with most people commenting that if they are displayed properly, tole trays are timeless. I love them still...although I only have one. My friend mixes her collection in her beach cottage with lots of white linen, bamboo and citrusy colors...looks fresh. I love the black ones hand-painted with flowers. I have a small 7" oval one I bought at a show in the Hamptons many years ago. I love it. There is a fine line between beautiful and granny...I don't know where that line is, but I'll take a black one with well-painted flowers any day. The trays are gorgeous. Who wouldn't want one? I don't own any, however maybe I should venture out to find one. I say timeless. Do you know the name of your white rose bush that you posted. I have one like this and would like to find some more. Mine blooms continuously and is very disease resistant. It was already here when we moved in. I enjoy your blog! If tole trays are "grandma" then call me "granny". I'd love to say I have a collection, but I only have two...which I love. The photos of the antique dealer's booth took my breath away. Great post. The more blogs I read the more I know my house is getting dated ~ tole trays, yellow walls, cabbage rose drapes and toile fabric. But, I still love it and I can't get excited about some of the new trends. In fact I am trying to redecorate my kitchen/family room and have been searching high and low on the web for some inspiration and no luck so far. Thanks for a thought provoking post and pictures of a fabulous booth. Maybe if no one likes the tole trays any more they will be really cheap? Something to look forward too!